Q: I am new to Photoshop Elements. Previously I used Paintshop which was easy by comparison. I bought Photoshop Elements All-In-One for Dummies, I also bought 'Elements Essential. This all leaves me more confused than ever as I don't see any benefit of 'Essential'. Firstly, on the welcome screen I have somehow lost everything on the right side except your 'Wiz girl Logo. On the left I simply have Two boxes - Organizer and Edit. There are no arrows on the bottom right hand corner and from memory, there was a tutorial box which also has vanished. Perhaps I have become a complete imbecile in my older age, but nothing that I read or video tutorials that I watch actually line up with version 8. Apart from undergoing a brain transplant to better understand, is there something I am doing wrong? Or is there an answer to what I am finding extremely complex to fathom out????? A: Hi Lloyd-Please know that you are not alone in being confused and frustrated as a new user to Photoshop Elements. But I truly believe you can master this program. Just start out slow and take one thing at a time. First let me make it clear that Photoshop Elements is not my program. It is made by the Adobe company. I am just an independent user of the program that started this website to try and help others use Elements. Now let's address your welcome screen issue. I'm not sure what you saw the first time you launched Elements, I'm pretty sure there isn't a tutorial box. But don't get hung up on what you think was there previously. What you describe as seeing now with the Organizer and Edit buttons sounds right. 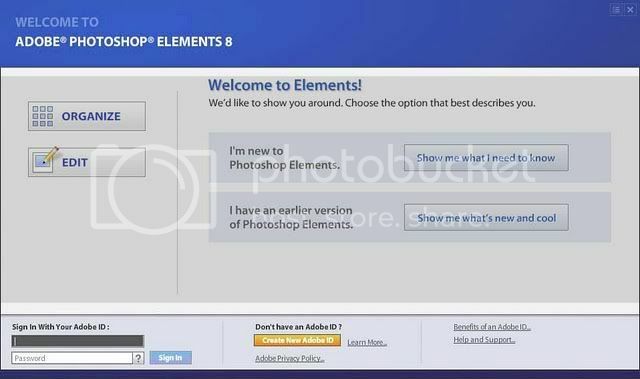 I work with the Macintosh version of Elements so my welcome screen is different from the PC version but here is a screenshot I found on the web for the PC version. For the sake of you being able to move on, just forget about what you think the Welcome Screen used to look like and accept that it no longer looks that way. It's not that important to your learning how to use Elements. Try making a simple change to one of your photos just to prove to yourself that you can do it. One of my shortest and easiest tutorials is on how to add contrast to a photo. Maybe start by working through that tutorial first. From the Welcome Screen click the Edit button to go to the Edit workspace. Go up to the File menu and choose Open…. Navigate to a photo on your computer. If you have one that is flat and dull looking choose that or just open any image. Most images can benefit from a boost in contrast. Go to the Add Contrast tutorial and follow the 3 steps from there on your photo. There, you have used Photoshop Elements to add contrast to one of your photographs. Now try another tutorial on a different photograph of yours. Do you have one where somebody has red eye? If so open that photo and follow the Red Eye Removal tutorial. That one has a written and a video tutorial to follow. It's fairly short and not only will you learn how to remove red eye, but you will learn how to make selections, zoom up, and create new layers. As you keep working through the tutorials you will gain more experience and become more comfortable and familiar with Elements. Lloyd, you can do this. Just keep trying and don't give up. Keep asking questions if you get stuck. I will try to help you if I can. And other readers to this site are encouraged to submit comments if they have something helpful to add. But I suggest you try and figure it out yourself first. There is a lot of free information out on the web. But if you get stuck, don't hesitate to submit a new question here. Hey Lloyd, I don't know how long ago your question was posted, I have only just found this site. In any case, I am an old wrinkly trying to understand all this computer stuff and it's driving me crazy. Perhaps we can form a "Help The Wrinkly" group and some of these young computer guys can take their time and explain like, K A T spells cat, to teach us. I am trying to begin with Elements 9 but it starts, presuming that one has some experience so I cannot even get going. This site looks exciting and I hope deals at least a little bit with this type of thing at Wrinkly level. Does anyone know of a book that is REALLY basic on how to learn elements 9.